Michael and his wife, Laura Brown Kenny, are communicants of St. Peter the Apostle Catholic Church. They are blessed with four children: Michael Jr., Nicholas Vestus, Melinda Lane and Robert Ryan “Rudy”. Michael, Laura and Robert own and operate Mike Kenny Roofing Company and represent the third and fourth generations to provide this service in Savannah. 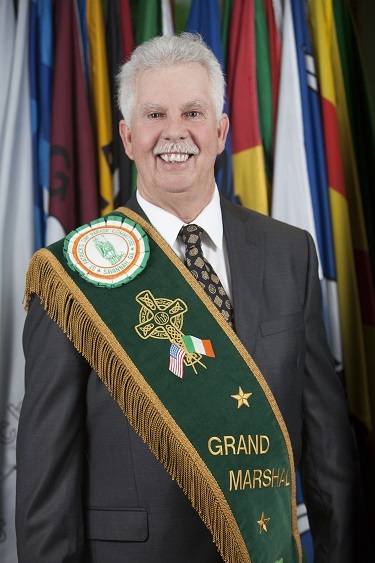 Michael has been an active member of the St. Patrick’s Day Parade Committee since 1976. He served on the Executive Committee from 2007 to 2016. Michael has dedicated 25 years to the Adjutant’s Staff and served as Parade Adjutant in 2012 and 2013. Michael is a forty-two year member of the Knights of Columbus Council 631 and served as Grand Knight in 1989. He is also a Fourth Degree Knight of Immaculate Conception Assembly 173. Michael is a charter member of the Friendly Sons of St. Patrick and served as President in 1989. Other active memberships include Catholic War Veterans (associate), Irish Heritage Society, Shenanigans Society and Police Emerald Society (associate). Michael’s family are no strangers to the honor of serving as Grand Marshal of the St. Patrick’s Day Parade. His father, Nicholas S. Kenny, Jr., served as Grand Marshal of the 1978 parade. Additionally, Laura’s grandfather, Vestus J. Ryan, served as Grand Marshal of the 1974 parade. Michael is also a grandnephew of Florence Martus, “The Waving Girl”, whose memorial statue still greets the container ships entering the Port of Savannah. Michael is described as a man of good character and a trustworthy friend who always ready to lend a helping hand to those in need and to assist in many community efforts.